Every now and again you just need something decadent and sweet… That was me the other day. 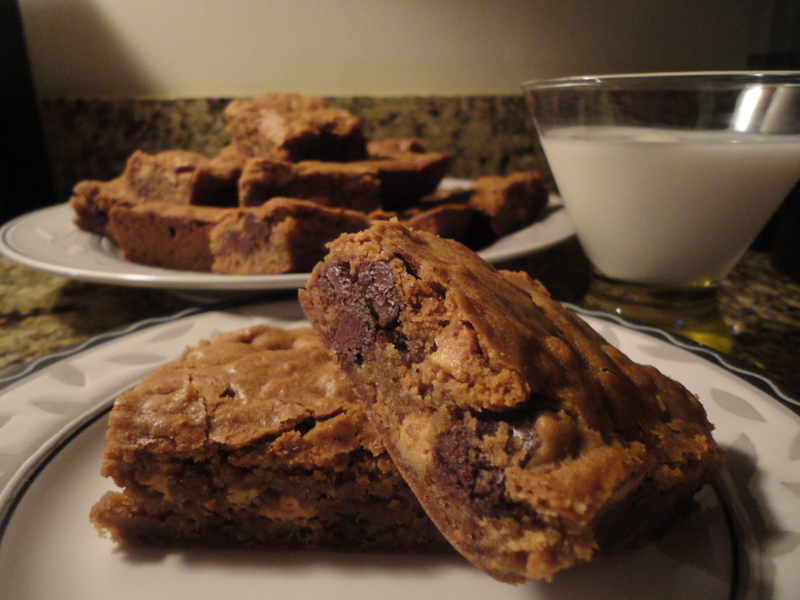 I decided to whip up some blondies with chocolate chunks and peanut butter chips, oh my God were they good. So good in fact that I had to get rid of them before my wife and I ate all two dozen ourselves! I put up a post on Facebook asking who wanted them and two lucky readers got a bag the next day. So anyway, here’s the recipe. Enjoy! Heat your oven to 350F & grease a 13×9 baking pan with butter, shortening or cooking spray. In a large bowl combine the brown sugar and melted butter, mix well. Add the eggs and vanilla extract, mix until it takes on a almost a caramel color and consistency. Add the flour, salt and baking powder, mix until moist, then mix in the chocolate chunks and peanut butter chips. Spread evenly into the greased 13×9 baking pan. Bake for 35-40 minutes, or until a toothpick inserted into the center comes out clean. Allow to cool at least 30 minutes prior to cutting and serving. That’s it… simple and delicious. Enjoy! Tags: baking, blondies, brownies, chocolate, peanut butter, perfect pairings, perfect pairings at home, sweets. Bookmark the permalink.